As a follow up on yesterday’s social media post, I figured I’d continue on with a similar theme. Most people spend more than 2 hours on their mobile phone over span of one day. I know I do. Do you? Be honest. My phone is an extension of my body. It’s sad to think about that, but if I’m without my phone, I feel disconnected from the world and I always think the worst. Like what if I get into an accident or what if someone is trying to get a hold of me in case of emergency? It’s the world at the palm of my hands and I definitely don’t want to miss my favorite actress post her #OOTD. It also doesn’t help that I don’t have a great internet connection at home. I hardly use my laptop at home because I’m on a shared network and it’s not ideal for the things I want to do. I miss having my own home, but I digress. Also at work, there are some things I’d rather search on my own device than on my work PC. Yes, I’m talking about those embarassing “how to” searches on Google! But jokes aside, I was curious to see what apps I use the most. As of 7:08 P.M. here’s what drained my battery today. FREEFORM: Now I know for a fact that I don’t use the Freeform app all the time. I’m 2 episodes behind on The Bold Type and I was catching up earlier today. I’m actually really loving this show, but that’s for another time. When PLL on, I’d rewatch the recent episodes on the app as well. SAFARI: It’s the iOs internet browser. Who doesn’t use this? Earlier today, I looked up guitar chords. I definitely use Safari a lot for random searches and when I click on those random links in my social feeds. FACEBOOK: Yeah, I like to catch up on your lives. I also like to watch the videos that go viral. Everybody loves a good laugh. SCORE! HERO: Once in a while I’ll get addicted to mobile games. This is my latest obsession. I don’t even like soccer that much, but this game is so addicting and with some in-purchase-apps, I’m sure I’ve spent at least $10 since I’ve downloaded it. $2.99 gets you unlimited life for 24 hours so you don’t have to watch ads to keep playing. INSTAGRAM: Stepping up my IG game, means I’m on it A LOT. I love keeping up with my favorite personalities, so you’ll probably see me double tapping in the morning before work, during work, after work, & right before I sleep. Then repeat. SPOTIFY: I definitely use Spotify more on the PC, but whenever I’m driving, I have my Spotify playlists going. Listening to the radio, gets repetitive and I’d rather listen to a playlist of my own repetitive songs. REDFIN: I definitely want to become a homeowner. It probably won’t happen any time soon, but I love looking at houses on the market and the prices they go for. Also, you don’t really know what your dream house looks like until you see an example. SNAPCHAT: There are times where I’m obsessed with Snapchat, but there are times where I’m tired of it. At this time, I’m not that into it, but occasionally I’ll open it up and see what filters are available. TWITTER: I have two separate twitter accounts: a personal one and one where I can fangirl, live tweet, and be me. No one I know personally follows my fangirl account and that’s great. I can tweet away without judgement. MAIL: All my emails in one place is ideal. Very rarely do I check my email on the PC, since it’s so easy to set up my emails on my phone. WORDPRESS: I’ve been writing a lot of my blog posts on the WordPress app. It allows me to write on the go, since I’m not sitting at my computer 24 hours a day. If I’m at the laundry mat, I can just open the app and write away while waiting for my clothes to wash/dry. Because I’m on my social networks on my phone, it’s really easy to share my WordPress posts on these apps as well! Mobile apps make everything so accessible. You’re not always going to have you PC or tablet with you. You won’t even have WiFi as well! So if anything comes up, all you need to do is bust out your mobile phone and voila! You can listen to your favorite music or follow your favorite celebrities and not miss a heartbeat. Check out your phone! 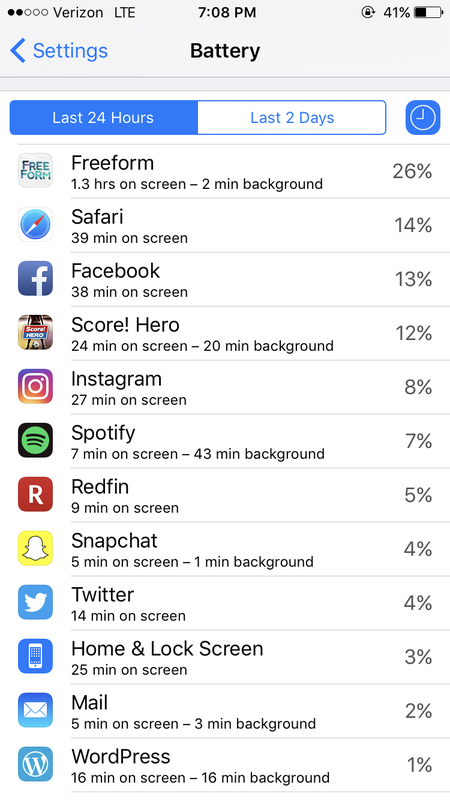 What apps drain your battery? This entry was posted in A blog a day August 2017, Personal and tagged blog, challenge, life, lifestyle, mobile, Personal, random, social media, writing on August 10, 2017 by Adele Fredeluces.